Making health addictive is really about harnessing the power of our fascination with mobile devices, particularly smartphones. We check these devices up to 150 times per day. What if we put a personalized, relevant, motivational and unobtrusive message in front of you some of those times? Could we induce permanent behavior change? I am searching for examples of these customized mobile, personalized messages and any resulting behavior change, so if you know of any, please let me know. I have a couple of leads from my last post and I’m in the process of following those up, so stay tuned. In the meantime, I’m laying out a framework for thinking about how we’d construct these messages so they would be welcoming and unobtrusive but effective in improving health outcomes. 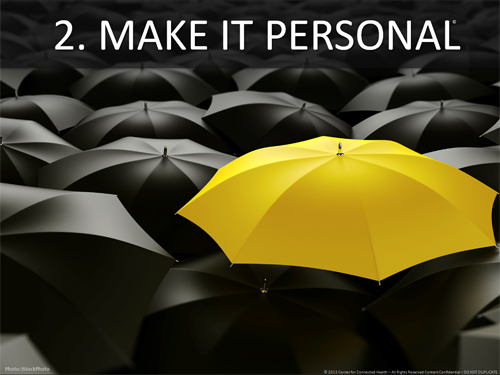 Personalization is taking on a whole new meaning these days. The advertising industry is leading the way. The main reason print media are on life support is because it is virtually impossible to target print adds beyond simple variables such as zip code or rough income level. Web search and ecommerce have given advertisers a whole new level of personalization to target their messaging. The main technology at work here is called cookies. These are tiny pieces of code that advertisers embed in your browser when you log on to various websites. They enable tracking of your browsing habits. So, when you’re researching new cars on the web, and visit websites of car dealers and manufacturers, you leave a cookie trail. That’s why you will likely see advertising pop up in your Facebook or other social media pages from your local car dealer, or promoting the latest leasing offer. They know you are interested and are now able to zoom right in. The next step is building a profile of your browsing behaviors and comparing you to other profiles. The software then predicts your interests based on those it determines to be most like you. This is how Amazon’s, Netflix’ and Apple’s recommendation engines work. When they get it right, it feels somewhere between eerie and pleasing. If you’re not thinking too hard, you’ll go with pleasing as in, “Wow, that is exactly what I was looking for” (I routinely marvel at how quickly Google predicts what I’m searching for as I type), but if you think about it you’ll feel a bit creeped out as you realize that some database in the cloud knows that much about you. And the technology keeps getting better. New technologies such as clickstream are being used (see recent articles in the Wall Street Journal and the New York Times). The experience is guaranteed to get more and more personal. And of course it’s coming to your smartphone too. We know that the advantages of personalized messaging also applies to health care too. Folks who have enrolled in our programs for chronic illness management and mobile health have told us that they stay engaged when the messages are personalized. We see this over and over again. We recently completed a study where the intervention was a twice-a-day automated text message. The message was programmed to take into account the subject’s motivational state, their activity level and the context of their neighborhood, all collected passively via sensors or by asking them a few simple questions. Early results are promising that automated, personalized messages were effective in improving activity. So imagine a world where we are collecting information such as your activity level, GPS data, mobile purchasing data, natural language processing analysis of your outgoing messages (tweets, texts, emails, etc.) all combined to give us a unique health-related profile of you. That will enable us to send you highly customized, personalized, relevant ads and messages each time you pick up your phone to check it (up to 150 times/day). Some of these messages will be so subtle you may not notice them. Some will be welcome and none of them will be annoying – if we do it right. I couldn’t agree more…healthcare more than anything else should be a personalized, pleasant experience- always waiting anxiously for your thoughtful blogs! We each have a processing center in the ventromedial prefrontal cortex which continually asks, Is this new information good for my survival? “Lasix is essential to avoid accumulating fluid and control your CHF” means much more than ” Take medications now”. Thanks, David, for adding the neuroanatomical perspective! Completely agree with you that personalization is key but the challenge I see is the economics of it. In spite of the decrease in the cost of computing power, a good personalization tool needs significant investment which is out of the reach of small companies. Because the returns are in the middle to long-term very few big companies will invest. I suspect you are right that the economics will be different. However, I remain optimistic. Along with all of the good things this does, how about privacy issues? Who else now has this personal information in their file that the user doesn’t even know exists? Privacy is always a concern. We will have to have many checks and balances in place so we preserve this fundamental right. I am behind the idea. I am a man that has lost 140lbs – does triathlons and marathons because I took ownership of my health/wellness. I help a few men with living a healthier lifestyle and often send them text messages during the day – checking in and sometimes words of encouragement or a thought for the day. It has helped them make better eating choices and has help lower stress levels. I hear the results from these men and know that it works. If the personalized messages – subtle or not helped improved the quality of life – life healthier – it is a great idea. What is your data source saying that we check our devices 150 times per day? What is the population age? And, do we know what portion of that checking is for email vs. text? Would an older population find it more intrusive to get 2 texts per day than a younger demographic and would the effects be different? Interestingly enough, age is only one factor here -we’re seeing more seniors using Skype, iPads, etc. However, your point is valid. This is the whole point of personalization. It has to resonate with YOU. One thing I like about the article is that health connection is slowly but surely becoming more and more digitized as the age of technology progresses. Since personalization is one of the main keys to being able to implement this technology, it’s definitely going to take a while to implement but at the same time, once the technology is implemented, everything would be so much easier done. If and when the time comes and I’m still around to experience it, well, at least I can say to the future generations that they’re the lucky ones for being able to take advantage of the technological advances that they’re enjoying.